What do you want in a house painter? A beautiful result, in a short amount of time, at a fair price, with the least disruption. 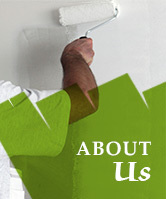 At Lafayette Painting, that's a promise we deliver on. We work year-round, and our full-time employees have been with the company for 6 to 20 years. During our busy summer months, when we hire seasonal staff, we put our most experienced house painters as crew leaders, so every customer gets full Lafayette quality. Whether you hire us for an interior paint job or exterior house painting, your job will be completed by proven professionals, not summer laborers. Unlike one-person painting contractors, we send a multi-man crew to your home, so we'll finish faster. Our "job site" might be your living room, so we hold ourselves to a high standard of cleanliness and professionalism. We're punctual and polite, and we treat your home as we would our own -- without your having to ask. An interior paint job is inherently personal. You're inviting us into your home for a couple of days, trusting us to keep your furniture intact, keep your floors clean, and keep your dog or cat from getting out. We take that responsibility very seriously, because our clients' trust is our most valuable asset.